Welcome to sunny skies, beaches of velvet sand, dazzling blue seas and tranquility. Welcome to Maalu Maalu, the hidden haven where you kick off your shoes sit back and leave the weary world behind. Built on the concept of a traditional Sri Lankan fishing village; or “Waadiya” as it is colloquially termed, the simple eco friendly architecture is inspired by the wooden Clad dwellings of a typical fisherman’s hut. The 40 rooms and adjoining public areas are designed to seamlessly blend with the surrounding environment. Each chalet with its cadjan roof elegantly highlights the indigenous Sri Lankan culture; the modern amenities are subtlely introduced, tastefully combining the old with the new. 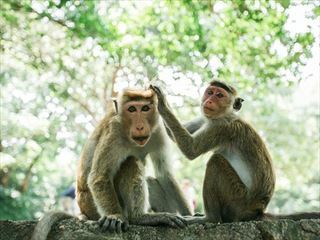 Here, amidst the splendour of nature and the opulence of modernity Maalu Maalu resort extends the warm welcome to a traditional Sri Lankan hospitality. Each rooms consists of two separate apartments; one on the ground floor and the other on the upper level attainable by an outer stairway. The ground floor units are equipped with a terrace whilst the upper level has a balcony. 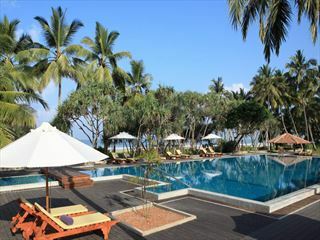 All rooms are designed to have a superb view of Passekudah bay. The 32 Deluxe rooms are furnished with all modern amenities you would require for an unforgettable stay. • A large bathroom equipped with international standard fittings, with two wash basins, WC, Bath tub, Rain shower & Aromatic toiletries. If you enjoy water sports go Wind Surfing or Kayaking. Snorkel or Dive to discover virgin coral reefs or even a shipwreck! Please be careful not to break any coral, which would damage the beauty of the underwater world. Law prohibits collecting live corals and shells from the reef. Join in a game of Badminton or Volley Ball. Fly a Kite or take a walk along the shore whilst selecting the best seashells of each tide. Work out at our state of the art gymnasium to keep fit or burn some calories. Walk or cycle through the neighbouring fishing villages and interact with the villagers to discover their culture and simple way of life. Rejuvenate yourself at the Ayur Vie spa. Based on ancient ayurvedic treatments passed down from generation to generation our range will replenishing your body, sooth your spirit and cleanse your soul. Oil baths, herbal massages and other signature treatments will be made available. Here you may also seek advice from our onsite ayurvedic doctor and undergo the traditional panchakarma treatment. Ayurveda, meaning ‘the science of life’ focuses on preventing illness through a deeper connection between body and mind. Once you visit the spa, take time out from life, and seek the ultimate balance of body, mind and consciousness. 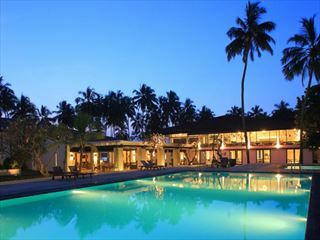 Relax in the Infinity Swimming Pool, or on the beach from whence you can enjoy a beautiful sunrise or sunset or the beauty of the Passekudah bay. The long White sandy pristine beach at the edge of the Turquoise Blue sea with the natural backdrop of lush vegetation, maintains a natural balance, making “Maalu Maalu Resort” a true getaway from the worries of the busy world outside. The Karadiya Restaurant is operational for breakfast, lunch and dinner and offers a scintillating array of authentic Sri Lankan food as well as international cuisine. Sea food is of course the speciality; ask the chef for the catch of the day or order à la carte if you prefer. Enjoy your meal accompanied by a superb view of the beach, the sweet music of the waves and the fresh ocean breeze. The open plan Bar situated across from the main restaurant is the ideal place to sit back ,relax and sip your drink of choice and take in the amazing view. The bar is operational throughout the day and is the ideal place for quiet reflection or pleasant conversation. For a more unique experience, enjoy your meal or a quiet drink at ‘Habala’ the pool bar or ‘Ruwala’ the pool Restaurant; our poolside bar and restaurant, the architecture to quaintly resemble two traditional fishing boats. What better way to enjoy your evening than to be out in the open, enjoying your cocktails before settling down to a delicious meal. Wind down after an eventful day at the jazz bar and shisha lounge. Simply sit back and let the music sooth your soul. If you’re in the mood for something more energetic, the discotheque is the place to be in the evening. The sloping roof and intimate setting gives it a cosy chic atmosphere, and it’s the perfect place to sum up a perfect day.